Whilst the Year 6 children enjoy the delights of 'African Adventure' for a week, Year 4 & 5 children are undertaking a boat-building project. The week started with a trip to 'Landamores' yacht builders in Wroxham, Norfolk. 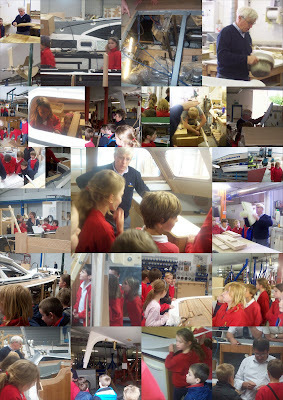 Their staff had kindly given up their lunch break to show the children around and explain how their fantastic 'bespoke' yachts are made to customers specifications. Seeing the work of extremely talented people at first hand was an eye-opening experience for everyone. The sheer magnitude of the production is highlighted by the fact that, on average, 16,000 hours are spend fitting out each yacht. Hopefully, the children have got a 'buzz' for yacht building as for the rest of the week they'll be planning and building their own versions! We are really appreciative to all at Landamores for giving up their time and making us feel so welcome. Boat Building - Day 4 - The Launch!